Roasted vegetables are popularly served with a roast chicken, turkey or any other meat. Roasting vegetables is a very healthy method of cooking them as most of the fat is not eaten and whatever little is left can be soaked off on a kitchen paper. Roasting works best with any root vegetable like potatoes, parsnips, sweet potato, yam, celeriac etc. 1) Cut the vegetables into big chunks. 2) Keep turning occasionally in the roasting tin for even browning. Also, it is a must to par cook the vegetables before putting in the oven, or else the vegetables will become brown on the outside and still uncooked from the inside. The fat you use for roasting vegetables largely determines the flavor. Duck or goose fat will be ideal but it is saturated so, if you would rather use sunflower or olive oil, that's fine too. Always remember, in your kitchen you are the Boss!!! Put the potatoes in a large saucepan, cover with water and bring to a boil. Simmer for 3-4 minutes then drain. When they cool down a little, hold each potato in your hand (carefully, don't burn yourself) and wipe them dry. Then with a fork, score the surface (meaning, run the fork on the surface of the potatoes so that it becomes a little rough). This will ensure a crispy surface during roasting. Put the oil or fat in the roasting tin and heat it on the stove top. When the oil is hot enough, place the potatoes in the tin and turn in order to coat well in the oil. Place the roasting tray in the oven and roast for 40-50 minutes until cooked through and evenly brown on the outside. Don't forget to turn them occasionally for even browning. Also make sure that the roasting tray is big enough. 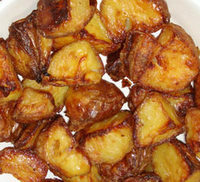 Too much crowding will result in steaming and potatoes will become little soggy instead of crispy. Once done, remove on kitchen paper and immediately transfer to the serving tray, sprinkle with salt and serve. You can roast any root vegetable in the same manner.